1. On May 24, 2017, the Islamic Dar al-Huda charity association, which is affiliated with the Palestinian Islamic Jihad (PIJ), held a well-attended ceremony to mark the end of the school year at its kindergarten in the Zeitoun neighborhood of the Gaza City. A great deal of preparation went into the ceremony, including scenery and costumes. 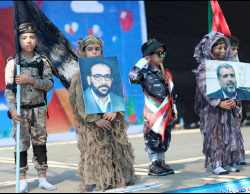 The children, wearing Jerusalem Battalions (the PIJ's military-terrorist wing) camouflage uniforms held pictures of Ramadan Shallah, the organization's secretary general, and Fathi Shqaqi, its founder. A loudspeaker played recordings of their speeches. The children presented a display simulating the killing of two ultra-Orthodox Jews by elite nukhba operatives because, according to the plot, the Jews had killed a Palestinian and his daughter (Facebook page of the Dar al-Huda kindergarten, June 2, 2017). Similar displays were held in previous years. 2. The Dar al-Huda charity association operating the kindergarten is affiliated with the PIJ. The chairman of the board and his deputy are PIJ activists. The association is supported by donations from Palestinian groups and international bodies and organizations.It operates an independent educational system in the Gaza Strip. The kindergarten in the Zeitoun neighborhood is one of 12 Dar al-Huda kindergartens in the Gaza Strip. It also runs two schools. 3. The Palestinian educational system, from kindergarten through university, brainwashes children and youth with hatred for Israel and support for Palestinian terrorism("resistance"). In Judea and Samaria brainwashing is less blatant than in the Gaza Strip. In the Gaza Strip, where Hamas is in control, it is aggressive, direct and blatant(as illustrated by the Dar al-Huda YouTube video) and Islamist-extremist in nature. The anti-Israel brainwashing is accompanied by military training, which the children receive as part of their school studies in preparation for their future membership in Hamas or other terrorist organization. 4. The display at the kindergarten begins with a child giving a speech praising Jerusalem. Then children wearing uniforms and hats with the logo of the Jerusalem Battalions (the PIJ's military-terrorist wing) come on stage. 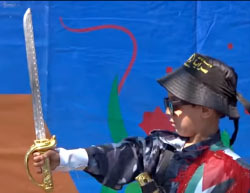 A child holding a flag of Palestine and a PIJ black flag comes on stage with a drawn sword to begin the ceremony, watched by a large audience. 5. Four kindergarten children come on stage dressed in military and camouflage uniforms. They hold pictures of Ramadan Shallah, the organization's secretary general, and Fathi Shqaqi, who founded the PIJ and headed it until he was killed in Malta in 1995. Recordings of their voices are played in the background. In one, apparently a recording of one of his speeches, Fathi Shqaqi praises the role of the PIJ fighters (mujahideen) in Palestine and Lebanon, who, he claims, destabilize Israel and keep it from regional penetration. Then a recording of Ramadan Shallah is played, in which he says all Palestine, from the [Jordan] river to the [Mediterranean] sea is Arab Islamic landand that not one centimeter of the land of Palestine or one millimeter of Jerusalem can be surrendered. 6. In the next scene four children wearing black uniforms and red headbands, and armed with wooden rifles come on stage. They demonstrate wresting exercises of attack and defense. In the background a song is played in Hebrew whose words are, "Zionist, you came to Gaza, you came to your death." 7. Next, two children come on stage dressed as ultra-Orthodox Jewsand stand next to what is apparently a roadblock bearing a sign in Hebrew reading "Stop." According to the script, the Jews attack and kill first a Palestinian, and then his daughter who comes to protest and confront them. 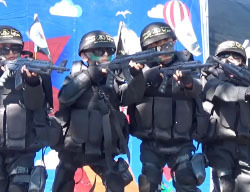 In response, four children dressed as Jerusalem Battalions operatives come on stage armed with wooden rifles and toy handguns. They attack and kill the two Jews. With their bodies still lying on stage, the children perform a series of weapons exercises. When they finish they pray and take selfies (YouTube, May 29, 2017). 8. Speeches are given by Sheikh Omar Fura, chairman of the board of the Dar al-Huda charity association in the Gaza Strip and a PIJ activist, and by Dr. Taher Lulu, his deputy, also a PIJ activist(Facebook page of the Dar al-Huda kindergarten, June 2, 2017). Throughout the ceremony there is a drone in the air, used, in ITIC assessment, either to photograph and document it or for reasons of security (YouTube, May 29, 2017). 1. Dar al-Huda is an Islamic charity association affiliated with the PIJ. It operates in the Gaza Strip, mostly dealing with helping children and providing welfare and health services. It is closely affiliated with the PIJ, although the affiliation is played down on its websites. Its main office is in the Zeitoun neighborhood of Gaza City. The association runs 12 kindergartens throughout the Gaza Strip and two schools, one in Zeitoun and the other in Beit Lahia (northern Gaza Strip) (Dar al-Huda website, June 2, 2017). 2. Dar al-Huda was established in Gaza City in 1993 and was officially registered in accordance with PA law in 1995. Dar al-Huda's chairman is Sheikh Omar Fura (Abu Usama), a senior PIJ activist in the Gaza Strip(Samaa News, November 13, 2013). He also delivers sermons in mosques in the Gaza Strip and represents the PIJ at various events. For example, he represented the PIJ at the funeral of Ra'ed al-Harazin, a PIJ military-terrorist wing operativewho died in Egypt after an illness. He gave a eulogy in which he called on the PIJ's military-terrorist wing to continue the path of jihad and "resistance" [terrorism] to prevent Israel from carrying out any possible attack on the Palestinian people (Paldf, June 20, 2016). Omar Fura's deputy is Taher Lulu, a prominent sermon-deliverer in Gazan mosques and a PIJ activist. 3. The Dar al-Huda charity association does not publicize its sources of funding and support,thus we do not have updated information about that issue. 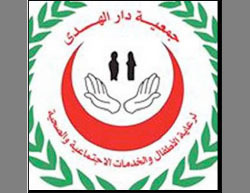 In the past, however (2016), several organizations were mentioned in connection with funding Dar al-Huda. They include Taawon, a Palestinian NGO; the Turkish IHH; and the American Near East Refugee Aid (ANERA), an NGO. It is also possible that Dar al-Huda receives funding from a Dutch organization (or organizations) (See pictures below). 4. In February 2016 Dar al-Huda posted pictures to a Facebook page it shares with the Turkish IHH in the Gaza Strip, documenting the visit of Mehmet Kaya, head of IHH in the Gaza Strip, to Dar al-Huda'sFatimah al-Zaharaa school in the Sajaiya neighborhood of Gaza City. The occasion of his visit was the completion of renovations in the school, which had been damaged during Operation Protective Edge. According to the post, the project had been funded [at least in part] by a "T-shirt campaign from the Netherlands." The actual renovations were carried out by the IHH. Mehmet Kaya had his picture taken with the school children and Omar Fura, head of the Dar al-Huda (Facebook page of Dar al-Huda, February 21, 2016). However, we have no current information about IHH or Dutch support for Dar al-Huda. 5. 5. On May 17, 2016, Dar al-Huda issued a tender for bids to renovate the al-Awda kindergarten near al-Fukhari, southeast of Khan Yunis in the southern Gaza Strip, which had been damaged during Operation Protective Edge. According to the tender, the project would be carried out with funding from a Palestinian organization called Taawon. The Taawon logo appears at the right on the tender heading; the Dar al-Huda logo is at the left (Facebook page of Dar al-Huda, May 17, 2016). 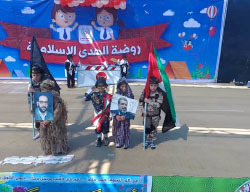 See the June 5, 2016 bulletin, "Kindergarten party held by a PIJ-affiliated NGO once again demonstrates the indoctrination of Gazan children with violence and hatred for Israel." Hamas, which supervises the educational system in the Gaza Strip, does not prevent the PIJ from operating its own education system. See the June 5, 2017, "Anti-Israel Incitement in the Palestinian Authority: An analysis of its roots and aspects." See June 5, 2017 bulletin, "Anti-Israel Incitement in the Palestinian Authority: An analysis of its roots and aspects." American Near East Refugee Aid (ANERA) was "incorporated in 1968 to help ease the suffering of Palestinian refugees after the Arab-Israeli War of 1967." It has "offices and warehouses" in the Gaza Strip, the West Bank and Lebanon. Its head office is in Washington, D.C. According to its 2016 report it contributed close to $58 million. Most of the money was invested in health and education (ANERA website, June 8, 2017). On March 9, 2016, the Dar al-Huda kindergarten posted its thanks to ANERA on its Facebook page. There were pictures of the distribution of shoes which had been donated to the children. Dar al-Huda deleted the post from its page. It is unclear if ANERA continues its support of Dar al-Huda. The campaign, based in the Netherlands, was called "Stand up for Palestine," and described itself on Twitter as "A civil campaign for creating unity, raising awareness and collecting money for Palestine by selling T-shirts" (StandupforPalestine#PalestineTshirt, https://twitter.com/PalestineTshirt?lang=en). Its website can no longer be accessed.